This report is based on a trip that Island Dreams' owner Ken Knezick made to Quintana Roo, Mexico in July 2013, and a follow-up trip to Isla Mujeres in July 2014 with an Island Dreams group of 30 who came to swim with "the big guys." The report includes info and insight into scuba diving, snorkeling, adventure tourism, and simply fun-in-the-sun. The reportage includes Playa del Carmen, Mayan ruins at Coba, snorkeling in Gran Cenote, new Cozumel hotels, and detailed information about swimming with whales sharks and manta rays at Isla Mujeres. As you prefer, you may consider the entire report, or jump directly to the part that concerns Isla Mujeres and the whale shark experience. Enjoy! Show me the whale sharks! -- Follow this link if you'd like to go directly to the Isla Mujeres portion of this report. VIVA MEXICO! -- Simply put, I love Mexico. From the high-born luxuries of Mexico City to the wilds of the mountains, jungles, deserts and oceans on both coasts, I find the diversity of Mexico's people, cultures, history and landscape wonderfully rich and appealing. As scuba divers, we are fortunate to have long flocked to Cozumel, making it the world's number one diving destination. But there is much more. The Yucatan mainland has the world's best cavern and cave diving. Isla Mujeres hosts astounding aggregations of sailfish, whale sharks, and manta rays. On Mexico's Pacific coast, the Sea of Cortez and Socorro offer tremendous opportunities for big animal encounters; sea lions, manta rays, whale sharks, yellow-fin tuna and schools of pelagic fishes. Simply put, Mexico is a treasure-trove of adventure tourism, with extra excitement and value for divers, snorkelers, sailors and fishermen. Thus I present you this report from my most recent journey to Mexico. It will hopefully provide you with some insight and suggestions as to how you may make the most of some of these many exceptional options. YUCATAN PENINSULA and QUINTANA ROO -- If I were forced to select just one area of Mexico for my own dive and adventure travels, it would be the state of Quintana Roo. 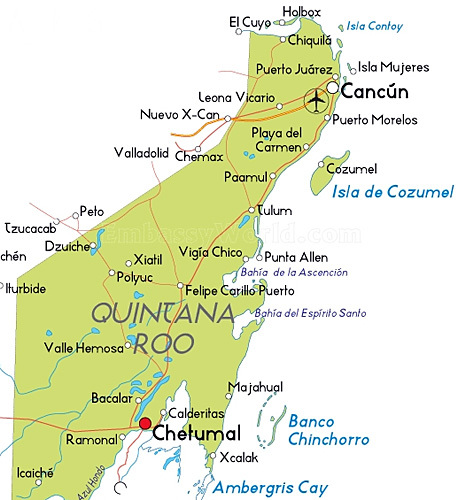 Encompassing the northern portion of the Yucatan Peninsula, Q. Roo includes Cancun, Cozumel, Playa del Carmen, Isla Mujeres, the Riviera Maya and the Costa Maya. The coastlines have fine white-sand beaches, and exquisite coral reefs, while ancient Mayan pyramids jut out of the jungle canopy where considerable populations of endemic wildlife and birds still survive. At Rio Lagartos, on the northern coast of the Yucatan, 30,000 flamingos winter. Beyond the great saltwater diving and snorkeling, freshwater cenotes dot the region, inter-connected by extensive underground cave systems. The longest mapped cave dives on our planet are here, and are still being further extended. Thus it comes as no surprise that the Mexican government actively promotes and expands tourism in this region. PLAYA del CARMEN and the RIVIERA MAYA -- From its beginning as a small Mexican fishing village with a ferry connection to the island of Cozumel, Playa del Carmen has experienced exponential development over the past 20 years, to become one of the fastest growing cities in the world. The attraction for tourists began with beautiful beaches and warm, calm seas, coupled with easy access to the Mayan ruins of Tulum and Coba, and the unique snorkeling of Xel-Ha lagoon. Once the island of Cancun had been fully developed, the savvy Mexican tourism machine looked south toward Playa del Carmen and cleverly dubbed this region the Riviera Maya. "Playa" is now home to almost 200,000 permanent residents, and the Riviera Maya boasts over 35,000 hotel rooms serving visitors from around the world. PLAYACAR PALACE RESORT -- Of these many Riviera Maya lodging options, I see a real sweet spot in the oceanfront, all-inclusive Playacar Palace Resort. While the nearby shopping and entertainment district of Playa del Carmen's Fifth Street can become congested and even chaotic, Playacar Palace offers an oasis of cool, calm, comfort. By the standards of the area, with only 201 lodging rooms this hotel is quite small, most of which are ocean view. The swimming pool, multiple bars and great restaurants offer immense variety, as do the many nearby attractions, from huge adventure theme parks to remote beaches, jungle cenotes, and ancient Mayan sites. For those who prefer indoor pampering over outdoor adventure, Playacar also graciously serves up one of the most exceptional spa experiences I've encountered anywhere in the world. With easy access from the Cancun airport, all of these hospitality assets are conveniently set on Playa del Carmen's most beautiful white sand beach, making Playacar Palace a great choice for an equally relaxing and adventurous fun in the sun vacation. CASA de GOPALA -- If you prefer a no-frills style of lodging in Playa del Carmen, there are many small hotels of varying levels. One good option is Casa de Gopala. Conveniently located just a short stroll from the center of the town and all of its restaurants, shopping and nightlife, this 20-room property is simple, clean and affordable. It is owned by the same people who operate Yucatek Divers dive shop, handily located right around the corner from the hotel. YUCATEK DIVERS -- Catering to serious scuba divers, Yucatek has been working in Playa del Carmen for more than a decade. 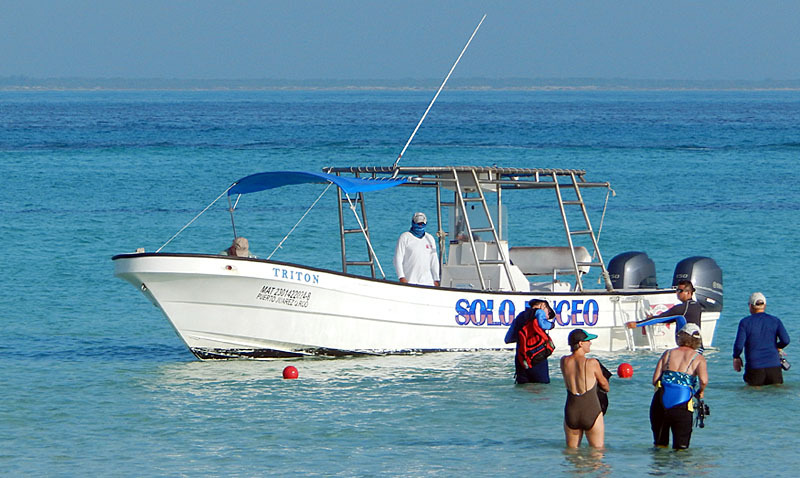 They have their own fleet of runabout boats to ply the local offshore diving, as well as being expert at providing cenote, cavern, and cave diving services and instruction. MAYAN RUINS of COBA -- While Chichen Itza and Tulum are much better known, Coba is a superb place to explore Mayan history. It is comprised of an extensive complex of temples and pyramids, set amidst original growth jungle. You can still walk or bicycle on the Mayan sacbe, the ancient roads that once connected Coba with surrounding Mayan cities and religious sites. It is the only place in Mexico where visitors are still permitted to climb up the main pyramid, Nohoch Mul, well worth the effort for the view and the bragging rights. 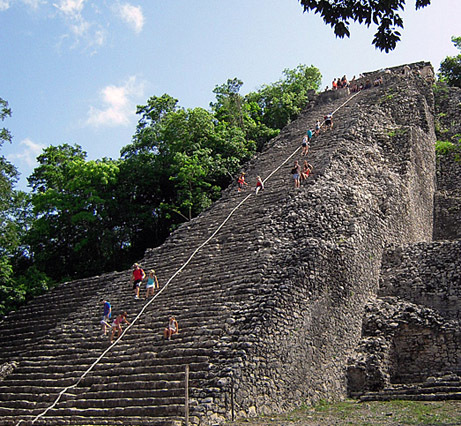 Those who enjoy history, culture, and outdoor adventure will find Coba to be a magical place. Try to visit early in the day, before the heat and crowds, and marvel at the multi-colored butterflies flitting through the light and shadows along the shady jungle paths as you trek among the ancient ruins. GRAN CENOTE -- After working up a healthy sweat climbing the pyramid at Coba, it was a treat to stop at Gran Cenote for a swim and snorkel. This is just one of the many cenotes that riddle the Yucatan Peninsula, and an easily accessible one at that. The cool, clear water quickly cut the heat, and I was able to free dive down with my housing and wide-angle lens and make a few pictures of the eye of the cenote. While I've not pursued the discipline recently, I am a certified cave diver and found myself envying the well-kitted (and well-trained) divers entering and exiting the extensive cave systems accessible from Gran Cenote. Yucatek Divers in Playa del Carmen offers a broad range of cavern and cave diving. I'm looking forward to a chance to return and make use of their services. PLAYA del CARMEN's QUINTA AVENIDA -- This famous walking street runs parallel with the ocean in Playa del Carmen, and it bustles with an international crowd of all ages, day and night. The "Quinta" is lined with shops selling everything from tourist trinkets to diamonds, authentic Mexican food to McDonald's, Starbucks, Haagen Dazs, and all the tequila and beer you'd care to imbibe. After dark, the numerous nightclubs come to life, pulsing with various styles of music and lots of enthusiastic drinkers and dancers. If you want to party, this is a fun place to do it. COZUMEL, DIVER's PARADISE -- Playa del Carmen and Cozumel are linked via a convenient 45-minute ferry ride that operates hourly throughout the day. I've been diving Cozumel for more than 35 years, and am fortunate to have made more than 50 trips there. At this point I have well-developed opinions as to the best lodging options and scuba diving services, but I'm always working to update my knowledge. So as part of this most recent trip, I rode the ferry over from Playa and made inspection tours to two of Cozumel's newest all-inclusive lodging options, and came away very pleased with what I saw. SUNSCAPE SABOR COZUMEL -- This family-friendly, value-oriented, all-inclusive option makes use of the property that was formerly Reef Club. Located on the ocean, it has 400 rooms, in a mix of garden, pool, and ocean views. There are multiple swimming pools, restaurants and bars, with both day and evening entertainment and group activities scheduled. There is also a small but nicely appointed spa with a full range of services available. Juan Leca's Dive House provides scuba diving and snorkeling services for beginners through expert and a full range of scuba instruction courses. SECRETS AURA COZUMEL -- Aura is an upscale all-inclusive, and Cozumel's only adults-only resort. 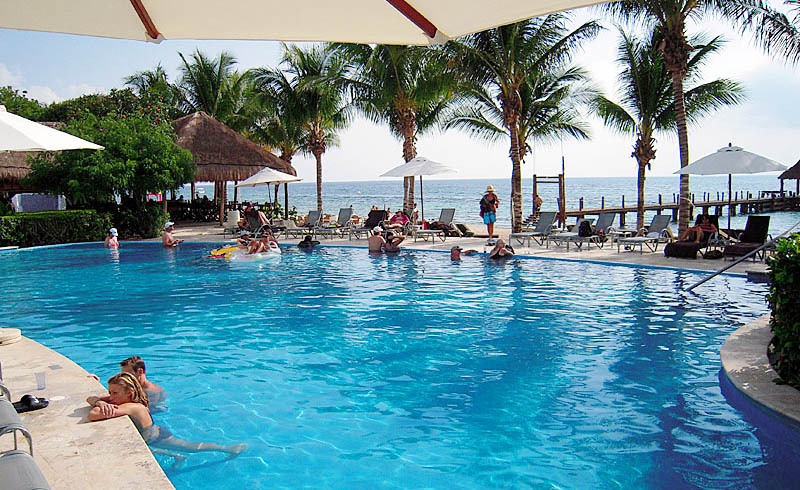 Many resorts have a swim-up bar... well Secrets Aura Cozumel has swim-up suites. With this lodging category, you can step out of your spacious hotel room, and directly into the swimming pool. Aura is a high-end property, with fine dining and attentive service throughout. Dive House also provides top quality diving services here. DIVE HOUSE COZUMEL -- Cozumel has more than 130 dive operations. On a good day, any of them can take you to the reef and put you in the water. But on another day, should you find yourself in urgent need of the services of true dive professionals, you will be glad you selected your dive operator with care. Juan Leca began his career as Cozumel divemaster and guide in 1980, working for some of the major operators. In 1988, he started his own company, Dive House, and has since advanced it to become one of the very finest dive services in Mexico. Certified as a PADI Gold Palm dive service, Dive House operates five dive boats - 46, 42, 35, and two 30-foot vessels. All Dive House boats carry radios, oxygen and first-aid kits, and are equipped with toilets, fresh water showers, water-level dive platforms and well-constructed ladders. Most importantly, all of Dive House's scuba instructors and divemasters have both PADI (often also NAUI) certifications, and many years of expertise in safely conducting open water diving on the reefs of Cozumel. ISLA MUJERES, Mexico -- Some 30 years ago, I had the good fortune to bring a few dive groups to Isla Mujeres. We did the sleeping shark dive, visited the shallow coral reefs of Garrafon and Manchones, and on one still vividly memorable day, snorkeled with giant manta rays in the blue water near Isla Contoy. So it has been a joy to revisit the island and see that, despite some modern development, Isla Mujeres has maintained all of its original charm. Once a Mayan religious site with a temple devoted to fertility, and at its heart still a simple fishing village, today's Isla Mujeres is a great place to enjoy sun and sea, beautiful white sand beaches, great Mexican and Yucatan cuisine, and fun shopping for local handicrafts and tourist regalia. There are a wide array of lodging and dining options, but for those of us who crave unique marine wildlife experiences, Isla Mujeres has something extra special to offer. NA BALAM RESORT & SPA -- For 2014 Island Dreams booked a block of rooms at Na Balam. This is a spacious and commodious property on North Beach, recognized to be the finest beach on Isla Mujeres. Na Balam offers a range of room styles and price ranges, from Garden View to Ocean View with Private Plunge Pool. All of the rooms are equally spacious and well-appointed with good beds and large bathrooms. There is a beachfront restaurant and bar with a smashing view of the ocean. Across the street are the garden view rooms surrounding a freshwater swimming pool and hot tub. The resort also has a yoga studio plus massage and spa services. Breakfast is included with the lodging. Other meals may be purchased in Na Balam's restaurant, or in one of Isla Mujeres' many diverse and fun dining options via a casual 10-15 walk into town. Restaurants of particular note around town include Fenix, Olivia's, Lemon, and Mango Cafe. For the very best ceviche, make your way to the local's favorite, Justicia Social. For those who prefer not to walk and explore, Na Balam offers the option of a meal plan. Snorkel boats pick up off the beach directly in front of this hotel. All in all I found Na Balam to be a very good lodging option for Isla Mujeres, and Island Dreams has booked it again for our 2015 Whale Shark group tour. ISLA MUJERES PALACE RESORT -- (This was my lodging in 2013. 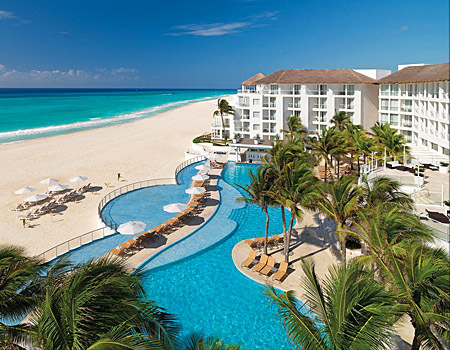 KDK) Across the sparkling bay, beyond the powdery white sand beach, Cancun's skyline is the distant backdrop at this couples-only, all-inclusive luxury resort. 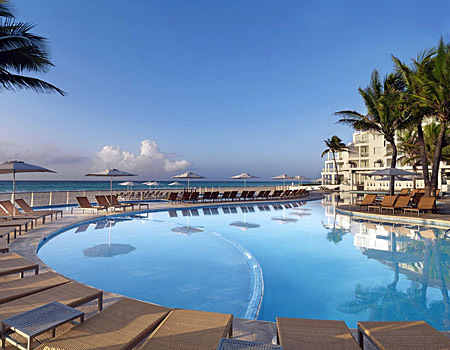 With just 62 rooms, Isla Mujeres Palace is a small and intimate experience. The lodging rooms are very finely appointed, and the spacious public areas are perfection. There is a huge open air dining room with both indoor and outdoor seating, all of which view the beach and the ocean. The all-inclusive dining is excellent, with breakfast and lunch served buffet style, and dinner ordered a la carte. The immense freshwater swimming pool features an inviting swim-up bar, while the pool deck and beach area have plenty of comfy lounge chairs. It you are feeling energetic, take one of the kayaks or the large pedal water bikes for a spin. There is an in-house dive shop, and a good deep water dock where boats for the whale shark trips are able to pick up. This is a truly superb resort and I hope that you can find the time to indulge yourself here. You'll be glad you did. 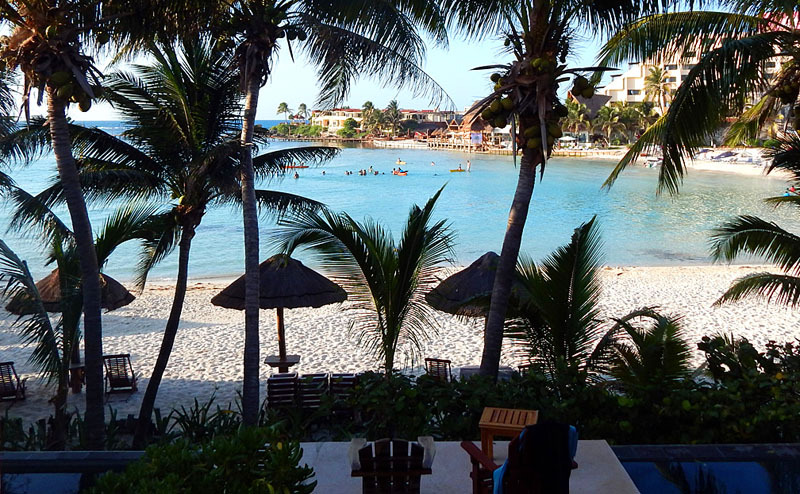 OTHER ISLA MUJERES LODGING OPTIONS -- While not as deluxe as Isla Mujeres Palace Resort, or as convenient as Na Balam, there certainly are other lodging choices in Isla Mujeres. These include Hotel Villa Rolandi, Playa Media Luna, and Ixchel Beach Hotel. Island Dreams will assist you in finding the best options and value available. WHALE SHARKS and MANTA RAYS -- These astounding animals have been swimming Caribbean waters for millennia, but it's only in recent years that the annual migration of whale sharks and manta rays has become an adventure tourism attraction. Though they are the largest species of shark, whale sharks are plankton feeders and harmless to humans. They follow their food source up the coast of Central America, around the Yucatan Peninsula and into the Gulf of Mexico. From mid-May through early September, they have been congregating in large numbers near Isla Mujeres and Isla Holbox. The tourism component began at Holbox, but it was soon found that access was easier via Cancun and Isla Mujeres, and that the encounters would take place in clearer waters. Now, on a daily basis through the season, as many as 90 boats set sail from Cancun and Isla Mujeres each morning, bringing snorkelers to swim with these gentle giants. (By Government regulation designed to protect the animals, no scuba diving is permitted). 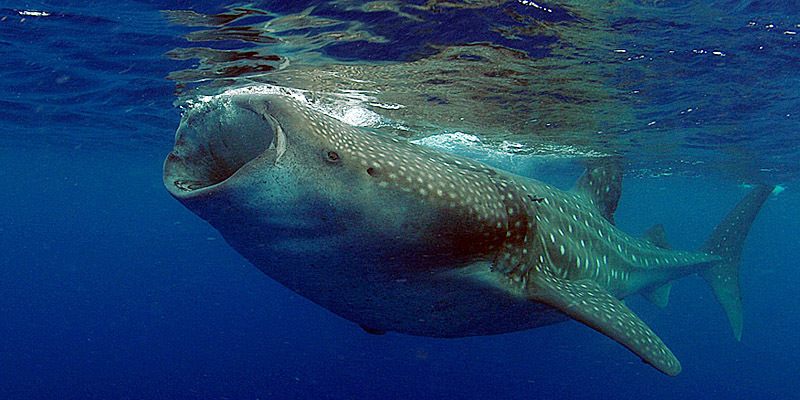 For the 2013 season, it is estimated that more than 300 whale sharks have gathered for this feeding extravaganza. Adding to the excitement, this year the whale sharks have been joined in Mexico by scores of large manta rays, also plankton feeders. The result is a glorious and easily accessible opportunity for lovers of marine wildlife and underwater photographers. THE WHALE SHARK EXPERIENCE, 2013 vs 2014 -- There was a considerable difference in the experience between these two years. 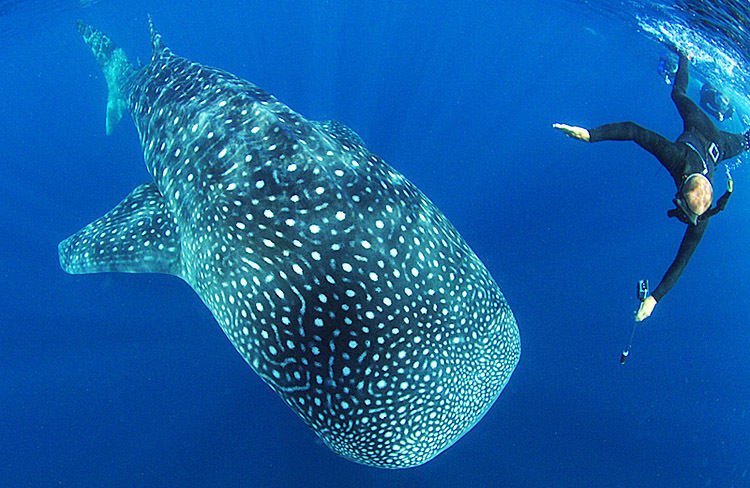 In 2013, it was estimated that there were 200-300 whale sharks feeding in the waters north of Isla Mujeres. For 2014, that population was estimated in the range of 30-40. So the same number of boats and swimmers were "sharing" a much smaller party of animals. 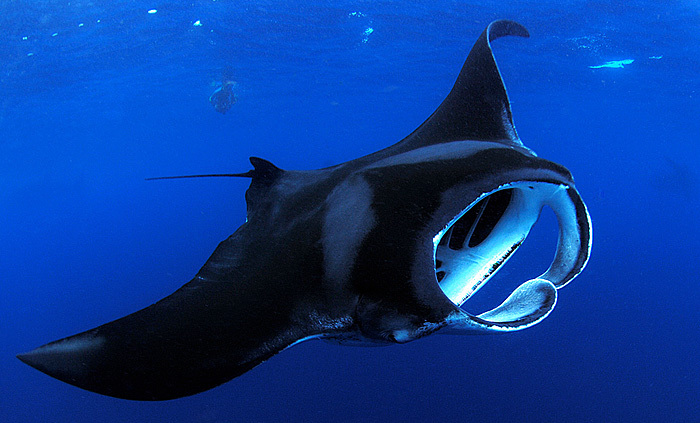 While there were quite a few manta rays among the whale sharks in 2013, I did not see any the following year. In 2013, I was able to be in the water, continuously, for more than two hours with multiple whale sharks swimming around me. Photo opportunities abounded. In 2014, regulations stipulated that only two swimmers at a time per boat could enter the water, and the interactions were often over within a minute to two. There were exceptions to this for boats that went out early, and were fortunate to find some feeding whale sharks before they were swarmed by other boats. It will be interesting, and I remain hopeful, to see what 2015 will bring. These are wild animals and they move to rhythms we do not comprehend. PS. Just heard from a buddy of mine who is in Isla Mujeres now (August 2014). Yesterday they had a slow day, with only a few whale sharks. But today they moved a few miles farther out and came upon a very large group of whale sharks happily feeding on a large accumulation of bonito spawn (fish eggs). This is great news...and bodes well for the future! SOLO BUCEO --Originally recommended to me by the lead photographer for Shark Diver Magazine, Island Dreams makes use of the fine services of Cancun-based Solo Buceo. The earlier your departure, the better chance of quality encounters before the crowds arrive. Our Solo Buceo boats arrived at Na Balam on time, and picked us up off the beach in waist-deep water. The trip to the whale shark feeding area is 45-60 minutes, dependent on water conditions. If you are at all prone to sea-sickness, prophylaxis such as Bonine or Dramamine is recommended. By regulations, a maximum of ten swimmers are permitted per boat, plus a guide. Swimmers wearing a neoprene wet suit may enter the water so attired. Anyone lacking a wet suit will be required to wear a bulky orange life jacket. So be sure to bring your wet suit as well as plenty of sun protection for your head, neck and hands. Lunch, water and soft drinks are provided onboard. The Solo Buceo boat captains were very skilled and experienced at carefully maneuvering around the swimmers and whale sharks. The length of the experience is up to each group of swimmers. Some boats return by noon, while others might stay out into mid-afternoon. The opportunity to swim beside these gentle giants makes it all well worth the effort. GETTING THERE and GETTING AROUND -- Access to all areas depicted in this report may be accomplished via air travel to Cancun. Airfares can be high during peak times, and for last-minute purchases, so plan ahead to get a better airfare. Private car transfers may be easily arranged, and it's a comfortable treat to be picked up by a late-model, air-conditioned Suburban with leather seats and a cold drink waiting. But if you'd like to save money, there is also very convenient public bus service throughout Quintana Roo. The following prices were in effect at the time of this writing. Prices are based on the exchange rate of 12 Mexican Pesos = 1 USD. It is pricer, but also much easier, to book a private car or van transfer from the Cancun Airport to Playa del Carmen, or to Puerto Juarez, the ferry boat pier heading to Isla Mujeres. As regular taxis are not permitted to pick up at the Cancun Airport, the alternative is to use public transportation. Air-conditioned express bus from the Cancun airport to Playa del Carmen is 71 pesos (approx. $6 USD) per person, one way. Ferry between Playa and Cozumel is 156 pesos ($13.00) each way. Public bus from Playa del Carmen to downtown Cancun is 35 pesos ($3.00). If heading to Isla Mujeres, from there you could take a taxi to Puerto Juarez. Isla Mujeres is easily reached via a 20-minute ferry ride from Puerto Juarez near Cancun, 38 pesos ($3.25) on the Magaña Express boat, and 78 pesos ($6.50) on the more modern Ultramar boat. Permit me to discourage you from renting a car and driving in Mexico. It is easy enough to do, but rental cars are often subject to stops by the local police, followed by shakedowns for bribes. It will be safer and less stressful to use public transportation, taxis, or pre-arranged transfers. THE BOTTOM LINE -- Mexico is a unique adventure tourism destination, ripe with options and travel values. All of the areas discussed in this report are safe for tourism. If you are a scuba diver, snorkeler, a lover of marine life, interested in ancient cultures, or just want to relax around the pool while gazing at the sparkling blue ocean, I can think of no finer destination than Quintana Roo, Cozumel, Playa del Carmen, and Isla Mujeres. Contact Island Dreams Travel and we will help you to enjoy it for yourself.